The term Bride of Christ is normally a metaphorical reference to the body of believers of the Christian Church, or the Ecclesia, although the term has several other meanings and has long been debated by Judeo-Christian scholars. The reference originates from the Old Testament prophets who described Israel as God's bride. 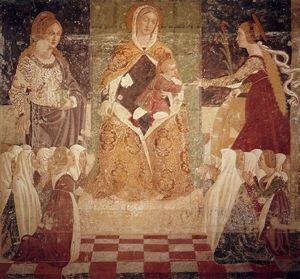 In the Roman Catholic Church, the image of the Church as Christ's bride has also been connected or associated with nuns and consecrated virgins. A less common metaphorical expression is to be found in believers who report a "mystical union" with Jesus Christ. For others in history, the image has been described as a more personal, spiritual relationship with Jesus. Several examples include Anne Catherine Emmerich, Joanna Southcott, Gertrude Morgan, Åsa Waldau, Catherine of Alexandria, Catherine of Siena, and Catherine de' Ricci. In addition, there is the idea of a literal, physical bride of Jesus during the period of his ministry, especially in the person of Mary Magdalene, with whom Jesus was said to have a child. Although considered heresy within most of Christianity, the suggestion of such a person has persisted, recently being revived through contemporary interpretations of the legend of the Holy Grail. You will forget the shame of your youth and remember no more the reproach of your widowhood. yet my unfailing love for you will not be shaken nor my covenant of peace be removed." Such an intimate and "elect" relationship as God's bride has subsequently been claimed by Christians, who see themselves as a "new Israel." 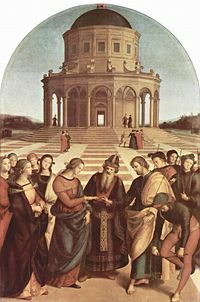 The imagery of the bride has often been applied to the body of believers known as The Church. In the New Testament, Jesus Christ is referred to as the bridegroom, sacrificing for and ultimately dying for his chosen bride. Traditionally, just as there is a betrothal period during which bride and groom are separated until the wedding, so is the bride of Christ separated from her bridegroom until the time of their "wedding" at the Second Coming. Her responsibility during the betrothal period is seen as waiting watchfully and "being faithful" to him. In further prophecy, it is said that at the time of the Second Coming of Christ, the bride (or Church) will be united with the Bridegroom and the official wedding ceremony—the Marriage Supper of the Lamb—will take place, resulting in the eternal union of Christ and his bride at last. In Christianity, virginity has been considered from the earliest centuries as a special offering made by the soul to its spouse, Jesus Christ. In contemporary Roman Catholicism, for both nuns and priests, celibacy (or "consecrated virginity") represents a calling to "mystical union" with Christ himself. Various notions have developed, and the phrase "mystical marriage" has come to be viewed in two basic senses; one wide, one more restricted. According to Roman Catholicism, "in many of the lives of the saints, the wide sense is intended. Here the mystical marriage consists in a vision in which Christ tells a soul that He takes it for His bride." 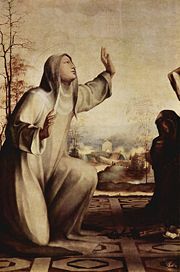 Catherine of Sienna, in the final years of her life, purportedly "besought her Divine Bridegroom to let her bear the punishment for all the sins of the world" after a life filled with the "wonderful spiritual fellowship of disciples round her, both men and women united to her by the bonds of mystical love." St. Catherine of Alexandria, a virgin and martyr of the Roman Catholic Church, by some accounts also experienced such mystical bonds, even marriage, to Christ. However, today, the Catholic Church takes a fairly cautious approach to such experiences, making little or no official mention of such accounts. St. Catherine de' Ricci (1522-1590), a Dominican nun, came to be known for her highly mystical life, especially for her ecstasies of the Passion (or suffering during crucifixion) of Christ at the same time each day for 12 years. Further, she was given in "mystical marriage" to Christ in 1542, evidenced by a "ring" that some reportedly saw on her index finger. In the more restricted sense, the term "mystical marriage" refers to that mystical union with God which is the most exalted condition attainable by the soul in this life, also sometimes called a "transforming union," "consummate union," or "deification." For Saint Teresa of Ávila and St. John of the Cross this was represented as the ascent of the soul toward perfect union or "the seventh resting-place" of the "interior castle." 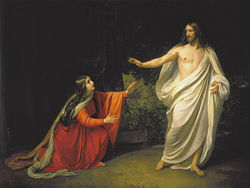 The idea that Mary Magdalene was the literal bride or wife of Jesus Christ has been popularized by several recent books and films, including, Holy Blood, Holy Grail (1982), The Gospel According to Jesus Christ (1991), Bloodline of the Holy Grail: The Hidden Lineage of Jesus Revealed (1996), and most prominently, The Da Vinci Code (2003). A recent discovery of a tomb containing caskets with the names of Yeshua and Miriam etched on them produced a controversial television documentary on The Lost Tomb of Jesus, reputedly, a possible tomb of the historical Jesus, Mary Magdalene, and their family. The (Gnostic) Gospel of Philip depicts Jesus in relation to Mary Magdalene as such that [he] "loved her more than all the disciples, and used to kiss her often on her mouth." Such notions are considered heretical by orthodox Christianity, but have persisted in folklore and myth throughout the centuries; there have even been claims that the Merovingian kings of France were Jesus' direct descendants. ↑ Bible Gateway, Ephesians 5:22-23. Retrieved November 23, 2007. ↑ Bible Gateway, Isaiah 54:5. Retrieved November 23, 2007. ↑ www.usccb.org, Catechism of the Catholic Church. Retrieved November 23, 2007. ↑ Bible Gateway, Ephesians 5:25-27. Retrieved November 23, 2007. ↑ Bible Gateway, 2 Corinthians 11:2. Retrieved November 23, 2007. ↑ Bible Gateway, Revelation 19:7-9. Retrieved November 23, 2007. ↑ Bible Gateway, Revelation 21:10. Retrieved November 23, 2007. ↑ www.newadvent.org, Mystical Marriage. Retrieved November 23, 2007. 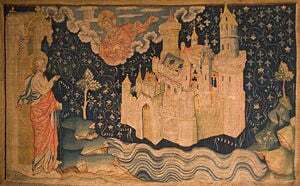 ↑ wwww.newadvent.org, Catholic Encyclopedia—St. Catherine of Siena. Retrieved November 23, 2007. ↑ 'www.newadvent.org, Transformed and distorted by fantastic and diffuse descriptions. Retrieved November 23, 2007. ↑ www.stthomasirondequoit.com, St. Catherine de'Ricci. Retrieved November 23, 2007. ↑ Discovery Channel, The Lost Tomb of Jesus. Retrieved November 23, 2007. ↑ www.gnosis.org, The Gospel of Philip; The Nag Hammadi Library. Retrieved November 23, 2007. What does it mean that the church is the bride of Christ? GotQuestions.org. The Bride of Christ by Pastor Jim Feeney, Ph.D. www.jimfeeney.org. Who Is The Bride of Christ? Chapter 14; by Eddie Chumney; Hebraic Heritage Ministries International. www.hebroots.org. The Bride of Christ by Paul Carus; The Open Court Publishing Co. (1907). www.sacred-texts.com. Catherine of Alexandria Orthodox Wiki. Saint Catherine of Siena www.domestic-church.com. History of Celibacy in Catholicism: Catholic Priests, Celibacy, Marriage atheism.about.com. The Legend of Mary Magdalene The Nazarene Way of Essenic Studies. www.thenazareneway.com. History of "Bride of Christ"
This page was last modified on 24 June 2016, at 18:43.